Archival Photographs: To Colour or Not to Colour? Until I began to see this colourization trend popping up everywhere in my Facebook newsfeed (the most recent example was an article from Vancouver is Awesome), I had never considered black and white photography to be any less real than colour. To me, a black and white image is powerful. The absence of colour forces you to see the detail in the photograph. The photograph was composed in a certain way by the photographer, who in most cases, intended it to be in black and white. In a paper prepared for the iSchool at the University of Texas, Cara Johnston wrote about the historical trend of hand-colouring photographs in the 19th century. It seems that photographers of the era shared my discomfort with the process. Johnston explains that “some photographers believed that to artificially color a photograph was to alter its truth-telling nature and was considered blasphemy to the profession.” As for modern digital colourization, I am not sure that I would go so far as blasphemy, but I am certainly struggling with this new trend. I was hoping to find reactions from other archivists on the re-emergence of this issue, but although I could find hundreds of modern examples of colourization and hundreds of accompanying excited reactions from the media and the general public, archivists seem absent from the discussion. When it comes to photo colourization, Wired has described Brazilian artist Marina Amaral as the master. Her work has been featured by Wired, The Telegraph, The Daily Mail, and MSN among other media outlets. She writes that “color has the power to bring life back to the most important moments…each photo is made to be realistic by recognizing the value behind each one of them, respecting and preserving their stories, paying attention to the finer details and maintaining their original essence.” Amaral makes a point of doing extensive research and consults with subject-matter experts. See some examples of her exacting handiwork in the video below. Mark Truelove’s Canadian Colour project brings a Canadian perspective to the colourization game, focusing on photographs from the City of Vancouver Archives and the City of Toronto Archives (admittedly because they provide full resolution images on their websites). Mastering real-life colour has been a challenge for decades. The first introduction of colour to the feature film world was exaggerated and audiences maintained that black and white was more realistic. But gone are the Technicolor days. Exaggeration has given way to painstaking accuracy, for the most part. Lloyd says the secret to doing the work is in “knowing where to look.” He digs through diaries and memoirs, government records, vintage advertisements, and consults historical experts. 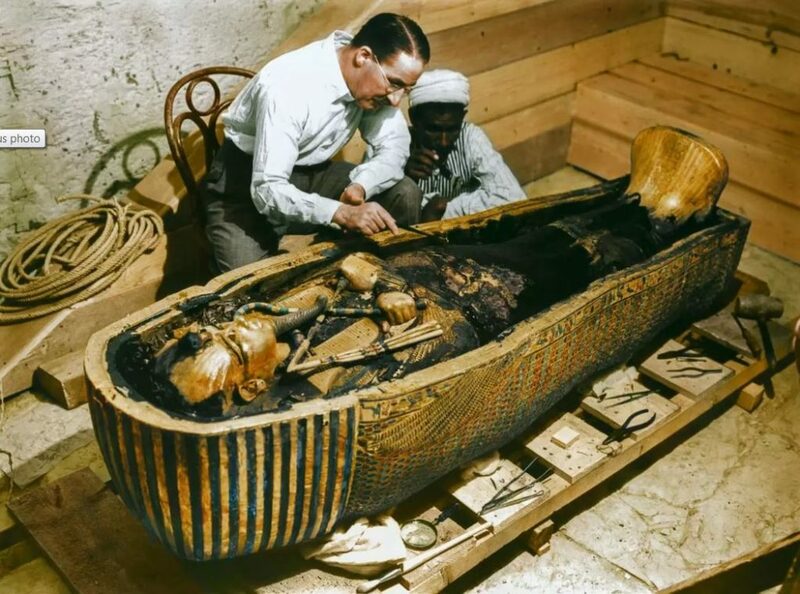 For example, the photographs of the Tutankhamun tomb discovery in 1922 were colourized by cross-referencing Howard Carter’s extensive handwritten journals with artefacts on display at the Egyptian Museum in Cairo. The photographs were used as part of an exhibition called “The Discovery of King Tut” staged in New York. Carter and a worker examine the solid gold innermost sarcophagus, October 1925. Image courtesy of Griffith Institute, University of Oxford, colourized by Dynamichrome. Amaral and Lloyd are now a part of the image. The photographs they choose, the choices they make, these are now a part of the image and it is changed, regardless of whether it is meant to be a more accurate reflection of the past. To me, the colourized photograph is a new entity, and Lloyd agrees, calling his colourized versions “supplements.” But it seems the general public may not make this distinction. While I can certainly see value in the expertly colourized photograph and I definitely appreciate the tireless research and consultation of archival records that is undertaken by experts in this field, this video about Amaral from the BBC worries me. In it, members of the public are asked when they think a photograph was taken. They respond “recently,” “in the 1960s,” and “2007.” The photograph of Lewis Powell, co-conspirator in the Lincoln assassination is from 1865 and has been colourized by Amaral. Their shock when the true date is revealed is where I think the problem lies. The colourization of this photograph has removed it from history. It may feel more “alive” but it has been taken out of context and for an archivist like me, that is problematic. 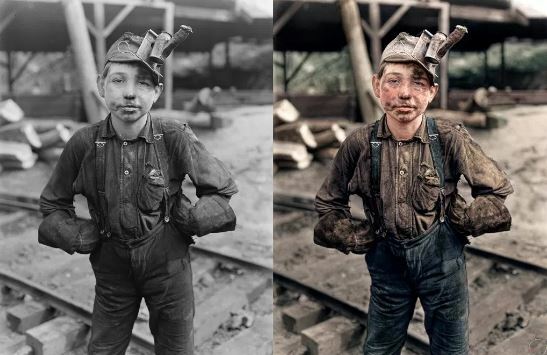 If the colourized photographs are encouraging more people to do their own research and learn more about the subjects of these photographs – then fantastic! But the skeptic in me suspects that people are consuming and disregarding the image just as quickly, if not quicker than its black and white counterpart. I would love to see some research on whether my theory holds up. I hope I am wrong and that colourization results in more meaningful engagement with the past. Experts like Jordan Lloyd conduct extensive archival research to ensure the utmost accuracy in their colourization. I am very encouraged by their attention to detail and their drive to ‘get it right.’ What I find more worrisome with the rise of modern digital colourization is that the tools are available to everyone. 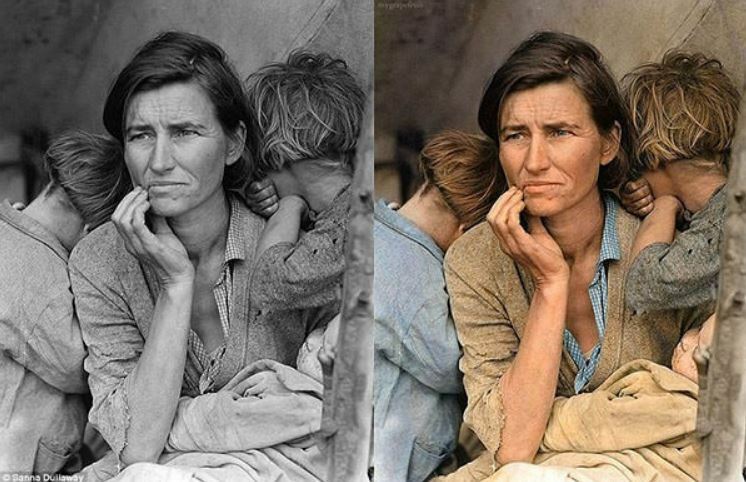 There are step-by-step tutorials on how to colorize black and white vintage photographs in Photoshop. There are published guides to hand coloring black and white photography. There are even algorithms that will do the work for you! Now, don’t get me wrong. I am all for democratic access and I am a proponent of a healthy public domain. BUT – historical photographs document critically important moments in our shared past. Some document atrocities and devastating conflict. These should be treated with care and respect. I worry that without the context, the emotional impact and educational aspects of the photograph might be compromised. After looking into this new modern colourization trend, I don’t feel that I am any closer to landing on one side or the other. I would say that like most things in the archival world – it depends! If properly researched and sourced, a colourized photograph can help to make a historic event more relevant to the present and therefore help a viewer to make a more emotional connection with the material. But there are issues of authenticity, context, and the photographer’s original intentions. 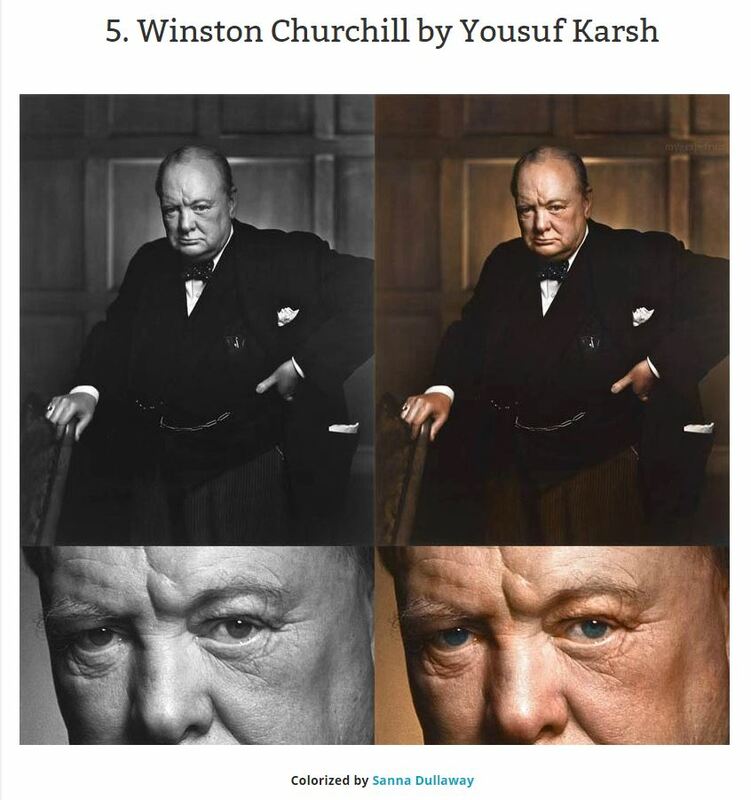 Something tells me that Yousef Karsh did not envision a colour version of his iconic Churchill portrait. Perhaps its a matter of that old Jurassic Park chestnut: “Scientists were so preoccupied with whether or not they could, they didn’t stop to think if they should.” Thanks Ian Malcolm. Something for us to keep pondering.